Success! I am sorry, a problem just happened. Not sure what, so could you try again later. Note, babblevoice no longer supports Netvibes babble Vibes. Please use babble Vibes instead. When designing our reporting system we wanted to build a very flexible system. Not only does 1 report fit all within your babblevoice world, but the need for well formated information is not limited to just babblevoice. So, whilst in the future we may decide to write our own reporting engine, we decided to write Netvibes Gadgets which now allow you to build your own report - pulling out the information you need, displayed in the format you decide. Along side other information such as Google analytics or your Facebook or Twitter feed. With Netvibes sadly there is no option to sign in with your Google account, although there is a Facebook OpenID system, which works well, as Netvibes does two things really well, it is a powerful business utility, a great social networking tool and any combination of the two. Although here we will go through how to make a standalone account to help you get starting into the process of Netvibes dashboarding. Firstly go to Netvibes where you will see the Netvibes homepage. From here you will want to select sign-in in the top right corner of the page. 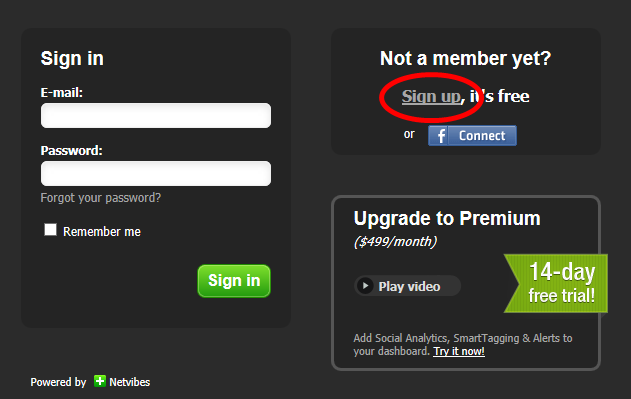 From here you can select either sign up, sign in through Facebook, take a trial of premium or pay for premium. Continue through signing up for a free account. Each Gadget represents a display of information. You might want a list of calls in and out of your business. Or a scatter graph showing waiting time in your call queue. You can add as many as you like, slicing and dicing the data as you want to get an understanding of how calls are being handled in your organisation. A couple of misc items such as voicemail, domain status. Pick the gadget which pulls out the data you are interested in, then you can configure the Gadget to display the data in the fashion you need. Also, check out the babblevoice University on Youtube or ask a question in our Google Group. babblevoice is a free to use business phone system, just pay for the phone calls you use.